Though the Saluki's heritage lies more than 10,000 years past, the preservers of the breed are the Arab peoples living in the deserts which have been the cradle of so many civilizations. They have, out of necessity produced two creatures of beauty by careful pedigree breeding almost since the beginning of recorded time. These are the Arabian Horse, for transport and war, and the hound for providing food. Long before guns were invented, the true desert Arab bred the Saluki wth the same care he gave to the breeding of his horses, valueing swiftness and beauty in horse and hound alike. It is believed that originally, each tribe bred a separate, distinct type of Saluki; the blondes and fawns in the golden deserts; the blacks in the black lava deserts; and the pale ones with smutty noses in North Africa. For many centuries, the nomadic Bedouin depended on the swift Saluki to bring down game for the tribe's cooking pots. Although dogs were pronounced unclean when the Islamic religion swept the Arab world (600 - 1918), a special exemption was made for the Saluki. It was believed that the Saluki was a gift from Allah and, like the Egyptians, they called the hound "El Hor," or the Noble One. Even today it is reportedly rare to find a Saluki wandering free in the Middle East. Many Arabs will not even admit to knowing that such a dog exists, largely because Salukis are venerated as holy dogs, for if they were not holy, Arabs could not eat of the game captured by them. Any ordinary dog or "Kelb" in the Middle East is considered a scavenger. Only those men holding high rank were permitted to own a Saluki and rarely was the Saluki ever purchased in it's Country of Origin, even now. Instead, they were given as gifts to those honoured by the owner. Puppies were raised in the harem, while the adult hound was the constant companion of his master, the Prince or Sheik. 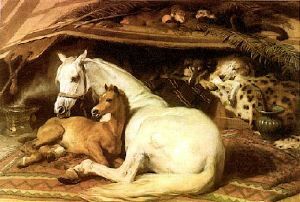 The Saluki was the only animal allowed to share his master's palace, tent, or room. In today's Middle East, the Saluki is going the way of the Bedouin -- being crowded out by the progression of civilization. 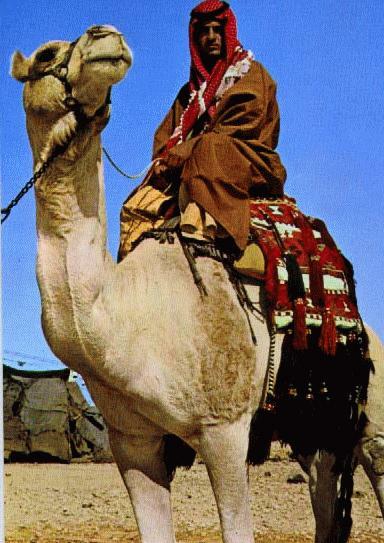 Fewer Bedouin roam the deserts; instead, they are moving to the cities and the role of the Saluki is fading away with this change in lifestyle. Royal families, nobility and the few remaining Bedouin tribes still use Salukis for hunting today. For the Princes and their families, it is now sport; for the nomadic Bedouin, it is as it always was. . . for survival. It has only been in the past 40 or 50 years that the Saluki has appeared on other continents, and then only as a result of gifts of honour having been made to distinguished Westerners who, recognizing the value of the dogs, have begun breeding them here. Today the deserts and the lifestyle of the Arabs are changing and the circumstances in which the Arab horse and the Saluki flourished may no longer exist. This could have meant the loss of the Saluki itself but fortunately the Saluki has woven it's magic on many who have become entranced and dedicated to this remarkable breed!